When I first started writing I loathed editing. I much preferred the freedom and playfulness of a first draft. Editing felt like hard work. And it can be. But I think what this actually reflected was my lack of confidence as a writer. When editing you have to be able to make tough choices – cut characters, significantly alter the story structure, change settings, murder your darlings etc. And how do you make these choices? By knowing your craft. Understanding characterisation, world building, story arc and sentence structure all direct how you shape your story. And while these things can be learned, they are only really absorbed with time. 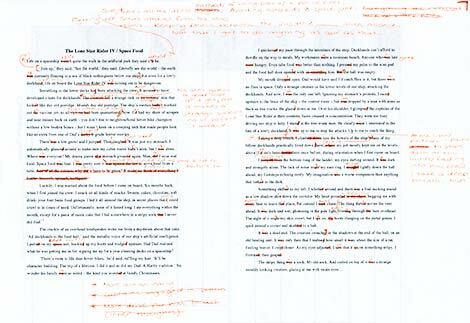 As I’ve become a more experienced storyteller, I’ve come to really love editing. When I first read a manuscript after letting it sit for a good month or so, I can suddenly see all its flaws (and an occasional strength too). I get a flood of ideas about how to make it a stronger story. Instead of getting the old rush of dread I now tend to get excited – all the possibilities! And I think this comes from the confidence of feeling like I know what I’m doing (mostly). Change of tense: The story is a humorous mix of thriller and action. Originally it was written in first person past tense, but it struck me quite clearly that it needed to be in present tense. Even though it’s in first person, the past tense removed the reader from the action. Present tense made it feel much more immediate – it sat you more firmly in the protagonist’s shoes and better built the tension towards the climax. Sentence order: The first sentence is vital. It’s a lead in to the story, the character, the setting and the voice. It was clear that my first two sentences needed to be switched. The same was true for several other paragraphs. The first and last sentence of every paragraph needs to lead the reader in and out of an idea, and with distance I could better see what each paragraph was about and how to do this. I also restructured many a sentence, shifting the stronger words to the beginnings and ends. Beef up the action: My characters have a bad habit of just standing around talking, instead of DOING things. The first three paragraphs of my story set it up well and were a great intro to the voice of my character, but there was absolutely no action. In each one I had to have my protagonist doing things that revealed his character, instead of just relying on voice. The old adage – show don’t tell. Character motivation: It wasn’t always clear why my character was making the choices he was. To make readers better empathise with his drive and his choices towards the climax of the story, I had to thread in some subtle tells about his character earlier. World building: The story is set in the future. On a spaceship. But it was written by a girl (hi) sitting in her suburban home in her PJs. On rereading it a number of words and phrases jumped out as inconsistent within the world of the story. For instance: I had mentioned an astro park, so was setting up an earth that no longer had real parks but instead made fake ones for people to wander through. But then later I compared a man’s arms to tree trunks, which was my suburban voice intruding. It doesn’t fit in this story as trees are not a regular part of their world. My protagonist is a pseudo mechanic in a world of machines, so he’d more likely compare the man’s arms to thick pistons. Bring on the funny: The voice of the story is quite wry and sarcastic. A number of times I dropped out of the voice and had to work to keep it consistent. I also added a few bits of funny to keep up the pace and offset the creepier moments. There were likely lots of other decisions I made along the way that I’m not even aware of. It took a few hours to finess all the changes, but I’m really happy with how the story has come together. So I’ve embraced my inner editor. It’s no longer a chore, but a challenge I look forward to. In fact, I so love editing I have started editing others’ work. I’m now doing picture book and early chapter book manuscript assessments through the QWC. And loving it. Now after waxing lyrical all about my editing crush, I must get back to working on my novel. My latest WIP. My first draft. Hmm … anyone sense a whiff of procrastination? Pretty, huh? But it’s not just fun, it’s also useful. You can immediately see which words you use most in your work. The high use words in this novel are the character names (can you guess who my protagonist is?) and many words specific to the world I created (like wight, bloom and prophesy). But there are other words in there I find interesting. Like ‘face’ and ‘eyes’ – clearly character descriptors I rely on. But also ‘like’ and ‘around’. For this word cloud I turned off the appearance of common words such as ‘a’, ‘and’ or ‘it’, but looking at the frequency of those words can also give you a sense of which ones you over rely on. I’ve discovered I overuse ‘but’ and ‘then’ – something I never noticed before, but now that I have I realise it has the potential to drive others bonkers. Again, the character names are king, but notice any similarities? Eyes and face. Clearly descriptive vices of mine. Even if it doesn’t drastically change the way I edit, it has given me something to consider when I look over my work. And besides, it’s fun, and I don’t need a better excuse to Wordle around than that. Go on then – you know you want to. I’m about to start the final draft of a mid-grade novel. I say final with a wry smile, because I’m well aware that if it finds a publisher there will be many more. So this is the final one before I send it to my agent. The previous draft involved a lot of rewriting, where I focussed on story pacing, structure, plot and developing the characters. This draft I’ll focus on polishing and tightening. The next week or so will be spent doing some final planning and research before the hard work starts. I approach final drafts by going through the story chapter by chapter, focussing on a specific list of things I need to develop (as a dedicated Virgo, I love a good list). Lay people often think that many things on my list just naturally arrive in a story, and sometimes they do, but for me they’re not consistently there in early drafts. Early on I’m so caught up in plot, tension and the delivery, that the small elements that ground a story in reality and make it visceral often get overlooked. It’s the later drafts where I make sure EVERY chapter and scene works as hard as it needs to. While doing this draft I’ll also try to tighten the writing, cutting back the words like a weed wacker. In my humble opinion nearly every final draft could be bettered by decreasing the word count. I’m obviously not suited to writing massive, rambling tomes: I love a good concise tale, with room for the reader to bring their own ideas to the table. So, what have I missed? What do others focus on in that “final” draft? I’m constantly amazed at how vividly a place can influence my writing. Its feel, its smell, the lay of the land, the palette of the landscape, the way the wind feels when it pulls at your hair. Every place is unique, which is why setting is so important in books. Setting gives us an immediate insight into the mood of a novel. A strong and tangible sense of what kind of story you’re entering and the characters you might encounter. I got to thinking about this recently while on holiday in New Zealand. Driving through the patchwork hills, in a climate so different to our own, the feel of the place vividly conjured the setting and characters from a story of mine. While walking along a river, the characters began to interact in my mind again, commenting on the terrain and noticing things I had not. I had a similar experience last year while in England, and on both trips kept a diary of these observations. In the final two drafts of the junior fantasy novel I worked on during my ASA mentorship, these diaries became invaluable. When first writing this story, I chose a slightly more European setting due to a need for a land with clear seasonal change – harsh winters and long dry summers – a climate as hard as the tribes that drive the plot. In early drafts I focussed more on the characters and their story, but in later drafts I had to work to clarify the setting. Yet the setting only became vivid and real once I had walked the land of my story. Once I had lived the winter that left only the hardiest plants alive, kicked my feet through muddied puddles of leaves, walked under clouds of ash and ice and marveled at skeletal trees greeting the morning sun. Andrew: Why wouldn’t you just say cow? Me: Because it wasn’t just a cow. It was a beef cow. The name comes from a journalism office, where the editors would remind their reporters not to return to the office without “the name of the dog” – not because they would necessarily use the detail in the story, but as a reminder to keep their eyes and ears open. Clark also says that “when details of character and setting appeal to the senses, they create an experience for the reader that leads to understanding”, and gives a range of fascinating examples highlighting just that. All this sounds simple enough, but I still find non-specific nouns lurking in my prose, even on the third read through: flowers and coffee and women that should be tulips and espresso and spinsters. Small details that immediately change the way a sentence rings. Words that give a clear image and conjure a mood the reader can’t mistake. When you say that your protagonist kicked a can, do you want us to see an indifferent nudge with the foot, or a moody thrashing? As a reader, I get annoyed when there isn’t enough detail – my mind automatically fills in the void, and if I’ve gone in the wrong direction, I get frustrated when (a few lines on) they reveal what was actually meant. I’m not talking about Attention Deficit Disorder (wouldn’t that be a curse for writers, who have to spend many hours at their computers writing and editing?). No, I’m referring to the three narrative parts of any tale: Action, Dialogue and Description. During my mentorship, Kate highlighted the importance of being aware of these three forms of narration, and the way writer’s can use them to create a careful balance. When analysing a slow passage of my story, I might find I’ve used two pages of straight action and haven’t given the reader any description (ie. a chance to orient themselves). Or maybe the dialogue has gone on for too long and it’s become a bit confusing what is actually happening in the book (ie. the pace has slowed). Too much dense text without any dialogue can be a problem too – have you ever found, when reading, that a book can slow down with too many heavy paragraphs? I find myself flipping pages, scanning for any dialogue, and if it’s too far off I’ll put the book down for the night (there’s nothing worse than losing a reader). I also find it takes me longer to pick the book up again. When you become conscious of these three narrative techniques, you can actively choose which to use at different points. You can pick the perfect one to heighten the drama or peak the emotional tension. You can create a balance that allows the reader to stay within the story, reeling them in at points and letting them breathe at others in order to absorb all the information. I’ve certainly come across other ways of breaking down the different narrative structures – anyone got others to add? Like any work, writing has a rhythm to it. It’s finding this rhythm, and becoming comfortable in it, which makes one able to do it each day. But the more I write, the more I discover that different projects have different rhythms, and that moving in and out of these can be tricky. For example, when writing a picture book, my rhythm is a little choppy. The word count is so small, so the first draft may be written in a single sitting, but then the editing and rewriting and polishing may spread out over months. I can move in and out of working on a picture book several times throughout a day, with small bursts of time spent playing with words, and much more time spent thinking about it all. I frequently move between writing and sketching – when stuck in one area, I move to the other. Doing the final illustrations is different as it’s much more focussed: once it’s all planned out I often spend up to 10 hours a day working on them (it’s very absorbing). On the other hand, my novel writing rhythm is more smooth. To write that first draft, I need to get in a rhythm where I’m working each morning, uninterrupted, writing an average of 1000-2000 words a day. I have to let the scene unroll in my head before writing it, and it’s easier to get into this rhythm if I do the writing at around the same time each day. Editing (especially in the re-writing drafts) is similar, where I need dedicated time to do it every day, so the characters are in my head and the story is unfolding and I keep that regular rhythm rolling. Moving between these rhythms is something I’m still learning about. After completing the mentorship novel I took a month out to work on a picture book, and so developed a much more choppy rhythm to my writing. Now I’ve returned to complete the second draft of a novel of mine, but I’ve lost my novel writing rhythm. I’m no longer used to sitting on the computer for long periods of writing. My mind is still flitting around as it does with picture books. I’m having to force myself to settle, and pin down the characters and make them play nice. I know I’ll get there. I can feel the muscle memories flexing as I write, stretching them out. My writing rhythm will settle once more, but it will take time. And patience. And baking (I made some scones yesterday – a sure sign of a bad day). But the sky is clear today. I am 6000 words in, and already excited about what I may achieve tomorrow.